Oh hai, hello, hi welcome back! 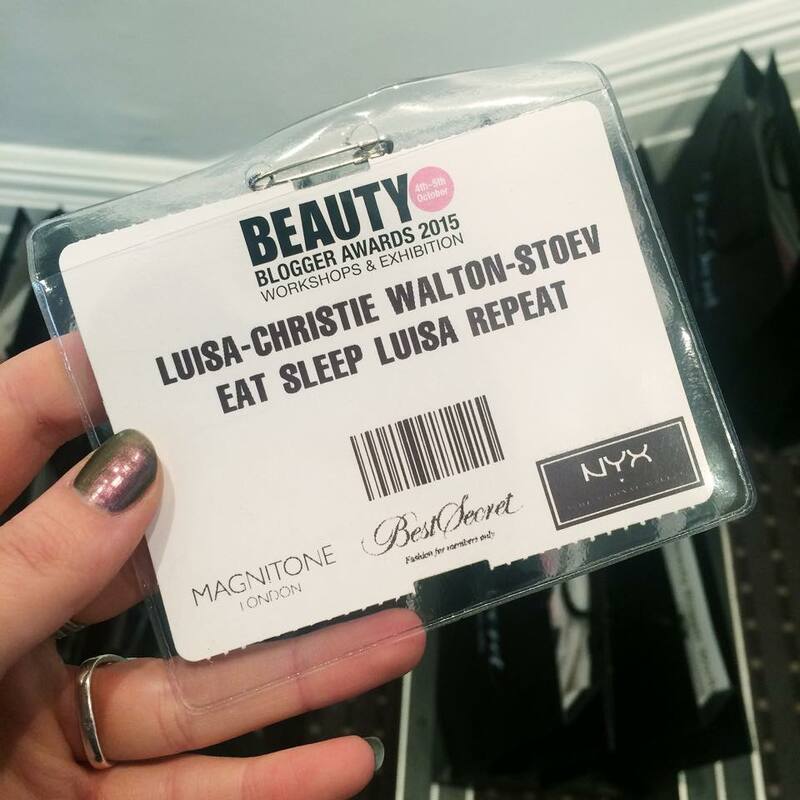 I’ve not done a “haul” post before, and I’m super conscious that it could perhaps become long and rambly… So I’m going for a sort of haul, with the products I got at Olympia Beauty 2015 (4th/5th October) with a Luisa/Glastonbury twist – because it all happened on the same day! Outfit of the day en route to @bbloggerawards with my babes @lissaije @saharasplash @gimmetea_gimmecats 🙆🏻 #ootd feat. brand new @blackmilkclothing! This weekend just gone, I was fortunate enough to attend the annual Olympia Beauty Event / Beauty Blogger Awards at Kensington Olympia, with the usual culprits, Lissa and Lauren (+ the addition of Sophie, a lovely babe who was visiting from Aus) and it was a pretty awesome Sunday… Partly because I was wearing my brand new Black Milk Merman Skater Dress which you can see in the picture above, but also because there was a bit of Glastonbury excitement in the morning! I’ll set the scene; on Sunday I was up at 8am, ready to try for Glastonbury tickets. Last year I camped with an awesome group of people who were kind enough to include me in their private Facebook group / team set up so I could be part of the stressful, anxiety inducing operation that is 9am on ticket release day, in the hope we can all have a blast together on Worthy Farm again. 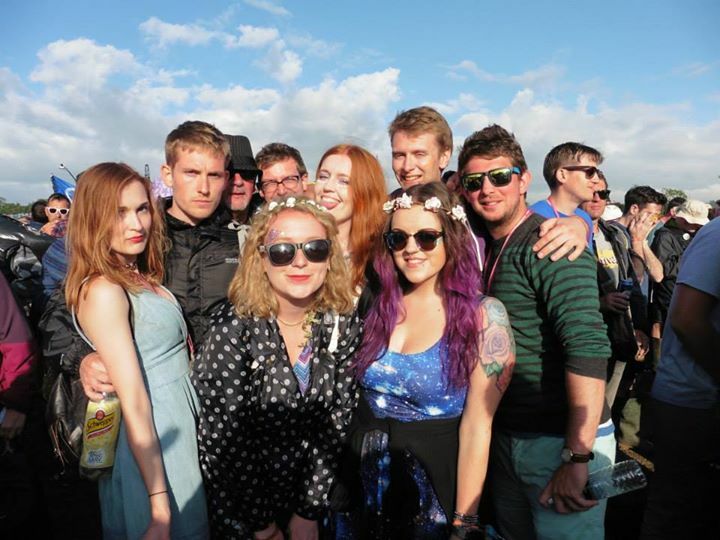 Glastonbury 2015 in the sun with some of the babes I camped with! If you’re not aware of the whole desperately trying to get tickets thing, I’ll briefly explain it for you! You have to register in advance and upload a photo (check out my embarrassing young face and emo fringe below), which then has to get approved, once that’s done you’re given a unique reference number. With this, your full name and postcode, anyone is able to try for a ticket for you – which at this stage is a £50 deposit. This was all very new to me as the past 2 years friends have got the tickets for me. 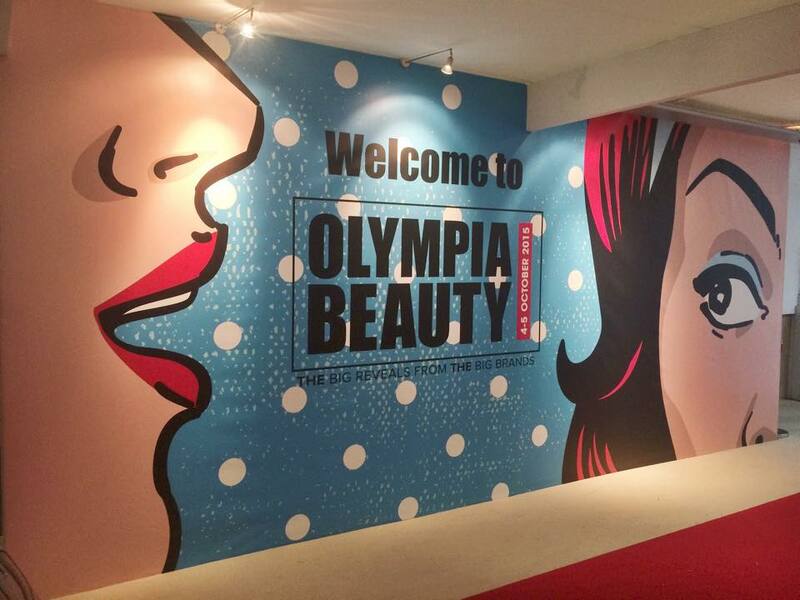 This is an annual event where brands congregate to showcase their new products for example (suction apples), treatments (eyelash extensions and teeth whitening) and some even offering show discounts and deals (exciting but very dangerous business! 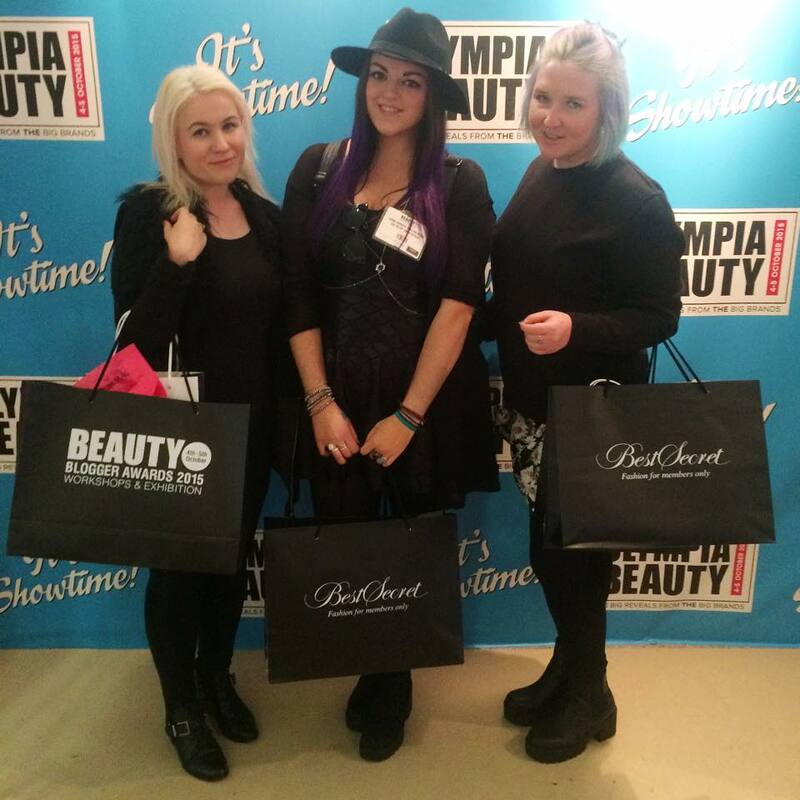 )… The main focus for me was the opportunity to discover some new brands to fall in love with. 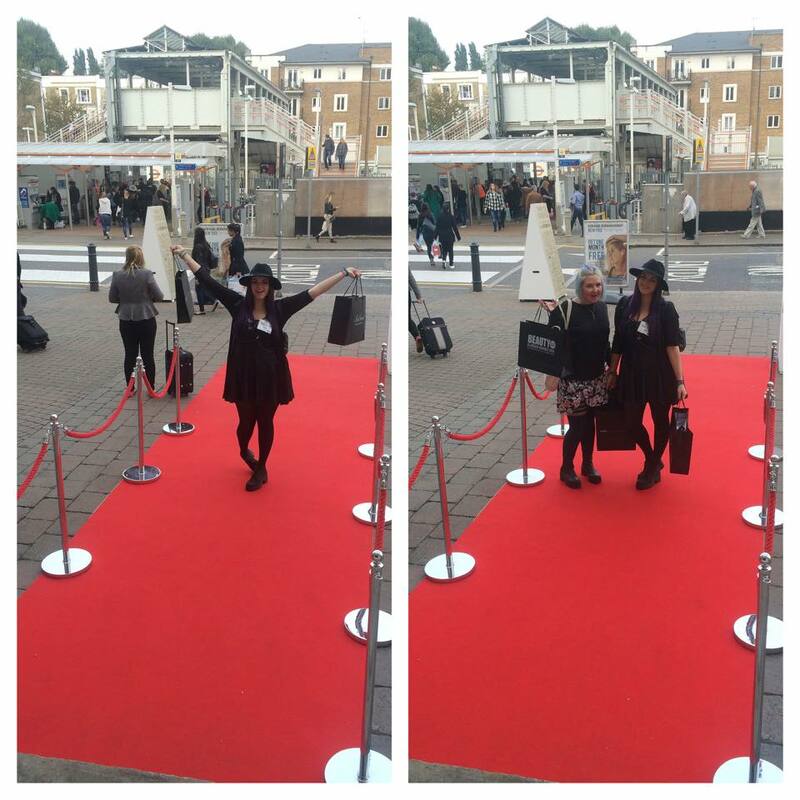 It was also extra exciting because not only did we walk up a red carpet to get into the venue, I received a name badge with my blog name on too, I felt very profesh! 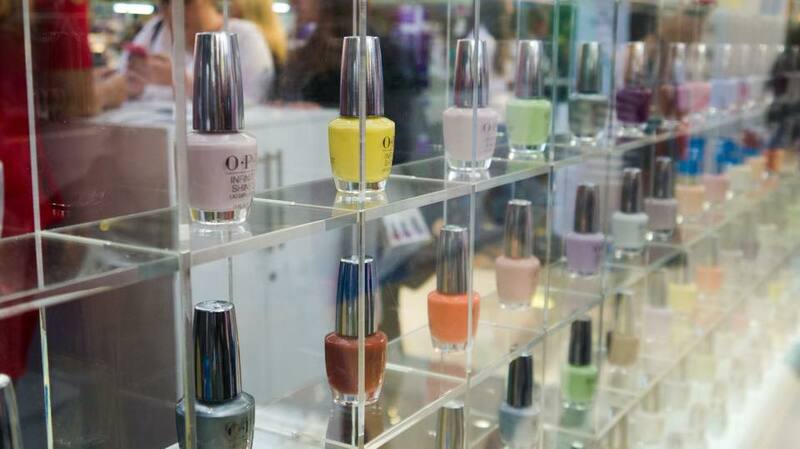 A lot of the stalls were Gel Nail Polish, in varying colours, and we saw a particularly impressive wall of OPI Nail Polishes at one point!! I’ve only ever had my nails done with gel once when I was in Thailand, and although I would love to have them done again (it lasted 4ish weeks) I’m not in the market to buy any gel polishes yet as I don’t have the fancy machine! 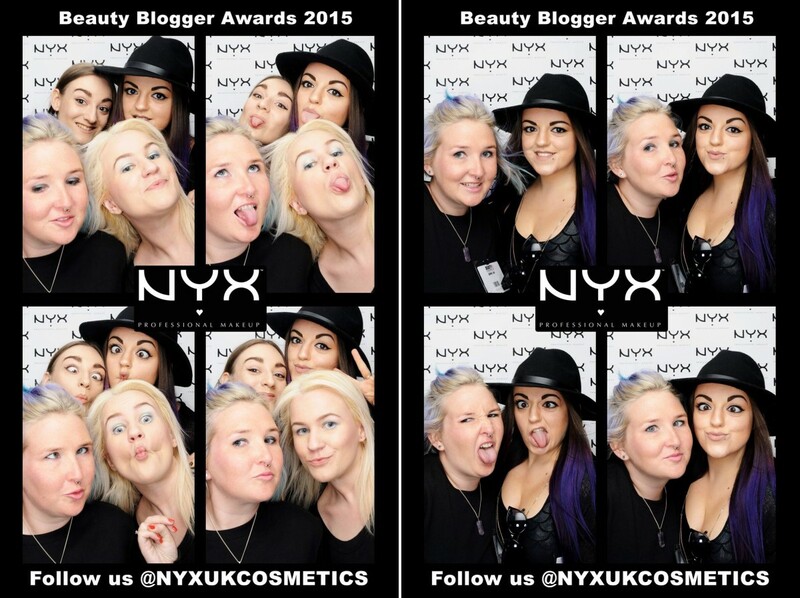 NYX Photobooth fun at Olympia Beauty Exhibition! 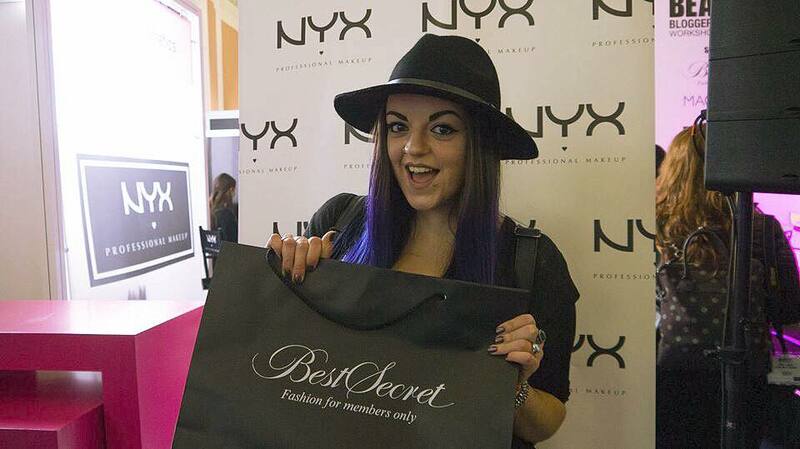 NYX were insanely generous at the event and after having fun in the photobooth (complete with wind machine as you can see above) we were handed a bag packed with products to try out. 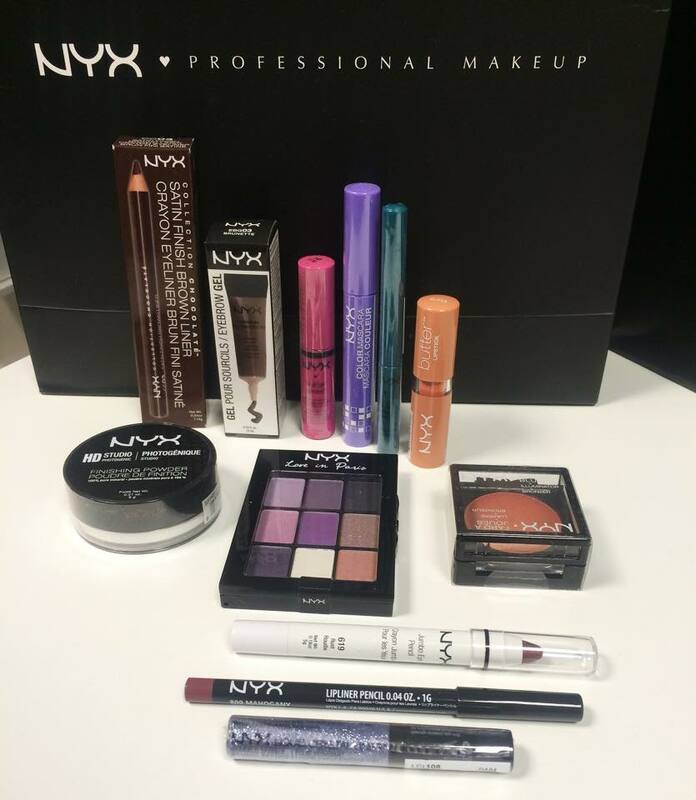 I’ve heard nothing but great things about NYX so was overwhelmed with the 12 free items below in my goody bag! The item I am particularly excited about trying the NYX HD Studio Photogenic Finishing Powder (RRP £9.50). the first time I saw a white loose powder I was very confused, but the idea behind it just mattifying foundation is very appealing to me as I do get a bit of a shine sometimes and if I do fall in love with this it’s a lot more doable price wise than MAC’s version (£20.50) which several of my friends use. After talking to a makeup artist on the NYX stand I decided there were more items I would like to try, and at the discounted prices I couldn’t resist. Really looking forward to trying them! Proof It! Waterproof Eyebrow Primer PIEB01 ($7.00) – this was absolutely raved about by the make-up artist. Apparently she got a pint of beer thrown in her face and despite that, her perfect brows didn’t budge one bit! I am forever noticing brow smudges at the end of a long day(/night) working/drinking/’festival-ing’ so can’t wait to try this out. Show price was only £4.95. 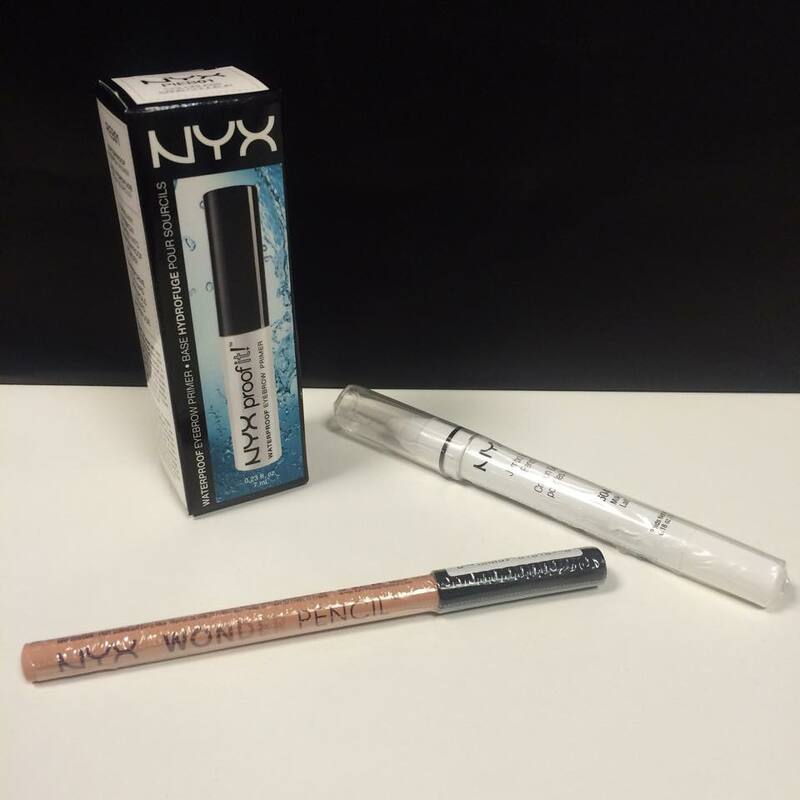 Wonder Pencil – Medium WP02 (£3.15) – this was a bit of a wild card, recommended me to a lady working at the NYX “shop” in the show area. It can be used to highlight lips as an outer lip liner – used in a similar way for brows, and it doubles up as a concealer! 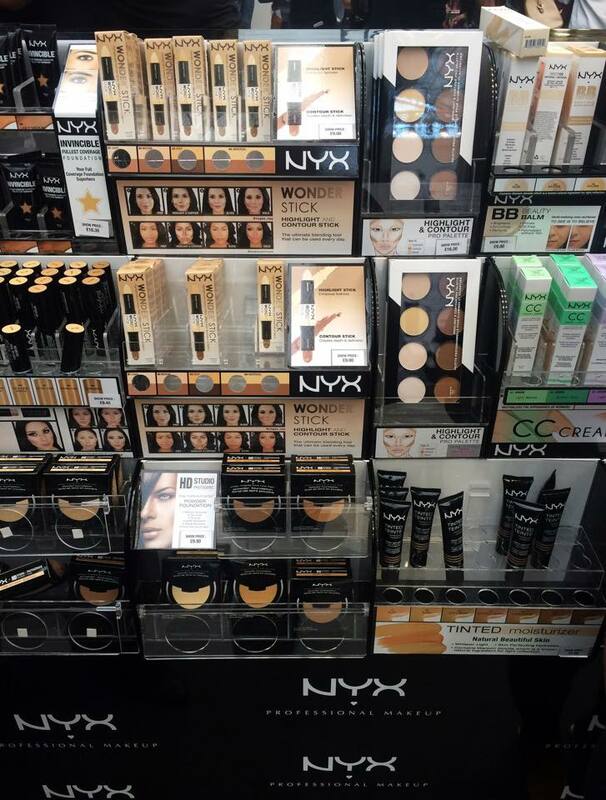 NYX Wonder Stick ($12.00, show price: £7 I think) – another product not on the UK sit, but it is available at Selfridges. 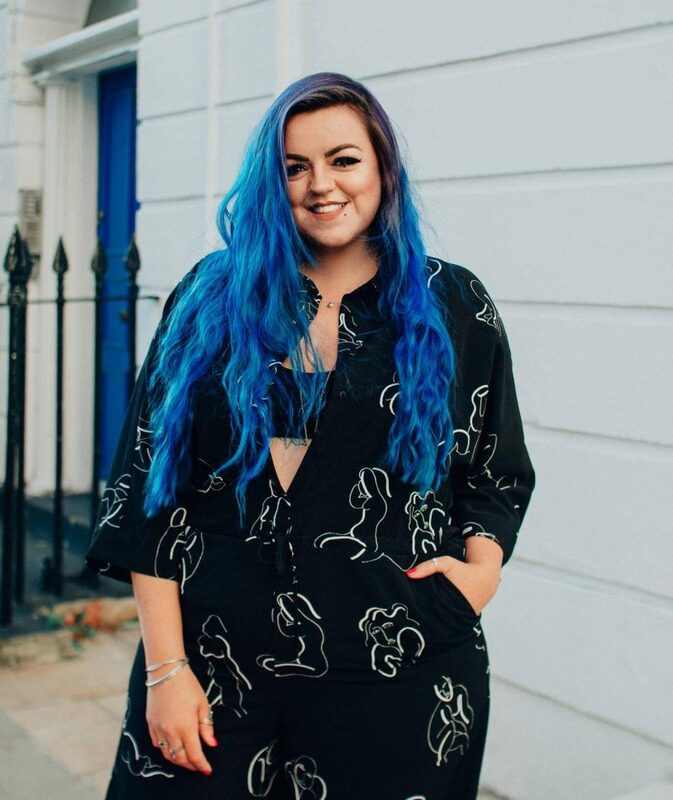 The girls had a play around with it and filmed a cute video before I arrived (whilst I was frantically trying to buy Glastonbury tickets) – imagine how easy this would be to use in a rush/at a festival!? I think later down the line I’ll give the whole make-up review thing a go in a separate blog if I’m feeling confident enough… Possibly complete with before/after selfies using the products? Watch this space! The first person I spoke to was a lovely lady who was the Marketing Manager for Hi Brow, and she kindly gave me some Growth & Conditioning Serum to try out! I am super excited to give this a go, after looking at some reviews on Amazon it looks pretty good! I was also introduced to 2 brands I am absolutely in love with (mainly because of the sparkly make-up they sell!). 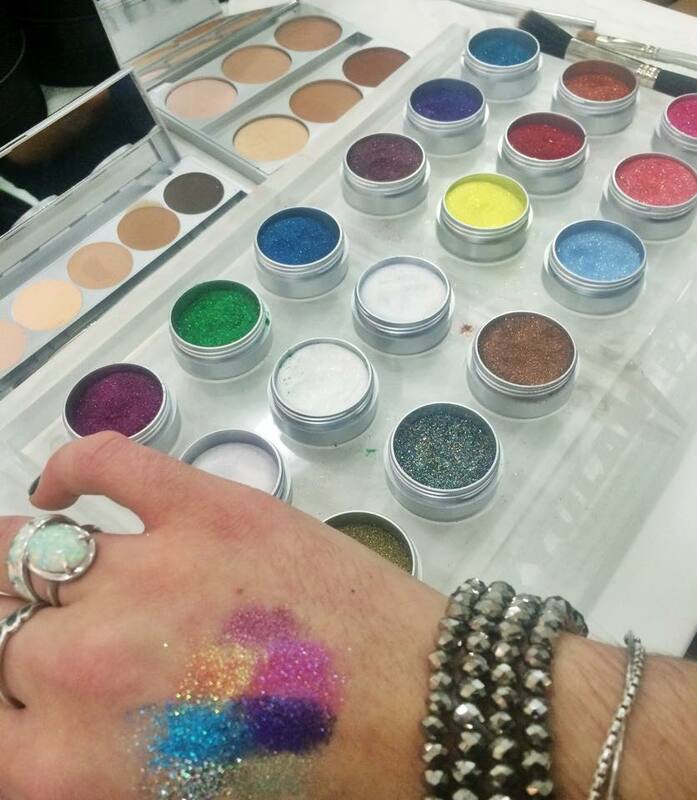 Both Inglot and Kryolan were selling amazing pigment powders! My absolute favourite of the day but a little more than I could justify for a tiny pot of glitter was Body Sparkles in 66 (£13), however my partner in crime Lissa bought it, and has promised to give me a little bag of it to try out <3 what a babe! 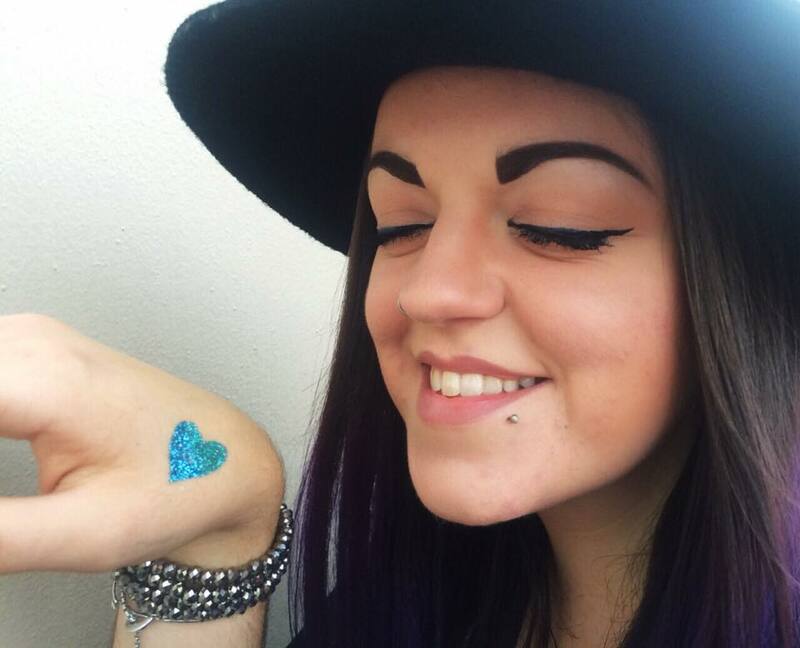 Check out her blog about the event – with loads of make-up stuff HERE! I saw a stall, with lots of sparkly jewellery and pocket mirrors that lit up your face (which is what initially caught my eye) and came across THE CUTEST make-up bag… I was instantly drawn to the little kitty face. A kitty on a large sized make-up bag (slightly smaller than A4) and after making lots of noises a bit too high pitched for a grown up to be making about a kitten make-up bag, I bought it for £12 (RRP £15 – similar available on the Catseye website). Ideal for festivals, could even use as a clutch bag… Is that weird? I don’t think it’s weird. I want the world to know about my love for cats. Conveniently after getting home I realised the washbag actually matched the Wallet and Coin Purse I already bought many years ago at an independent store in Brighton! Even writing about this makes me feel a bit funny… There is a new trend that involves sucking a hollow item to enhance the shape of your lips. I’ve seen so many videos of times people have tried it and it’s gone wrong, that the idea scares me a little. However, we spent a good 10 minutes at the Candy Lipz stall whilst Lissa decided on which one to buy . The UK ambassador for the brand is the stunning Luisa Zissman (who loved the name of my blog) and we spent a great deal of time talking about cats (the kitten makeup bag being the source of inspiration), and unicorns (something else I love, no idea how we got onto this topic though), whilst she showed me pictures of her beautiful horse, who in fact wears a sparkly unicorn horn! She is a credit to the company as she was so chatty and relaxed and clearly explained the benefits of the product. Although I’m not in the market for a lip suction device (I kinda like my little lips -plus the scar on my top lip might not enjoy the process), I feel like I know a bit about them and would definitely recommend the company to friends. So, you’re probably wondering what the glitter in the title is all about, so let me get onto my final purchase of the day… These I bought when I had categorically promised myself I wouldn’t spend anymore because I couldn’t afford to when payday was still 24 days away. However, as you will know if we’re good friends, I am like a magpie. I can’t not be drawn to sparkly things… And if it’s sparkly AND colourful its essentially game over. So you can imagine my excitement upon finding the stall that belonged to THIS WEBSITE. For some bizarre reason I didn’t take a picture of all the sparkly amazingness, but I would recommend browsing their website as the prices are very reasonable, the colours awesome and it’s the perfect place to stock up on glitter ready for festival season next year. After having a little glitter tattoo done for free I was totally sold, and exactly £10 later I left with one pot of jewels (£1), 4 pots of glitter (show price being £1.50 each, in colours: Emerald Green, Sea Breeze, Blue Moon, White) glitter body glue (£2 – which I’m told keeps glitter on your skin for up to 7 days – not for the face but perfect for making your body sparkly for the weekend and at a festival) and 6 stencils for £1) so I am now all set and have plenty of Glastonbury glitter! Glitter pots, body glue and stencils. I’ll definitely be attending next year, and I think I’ll save some money up especially so I can buy aaall of the things! Lissa, myself and Sophie at the end of a very long, but very fun day! Well done for making it to the end of this post, It’s quite a big’un and it’s only taken my 4 days to write… Sorry about that. That’s so funny about the cat clutch! I love that you now have a set. Hehe, so ridiculous… I am missing one from the set though (the make-up bag sized one) and might’ve just found it online for £9.99… Should I do it?